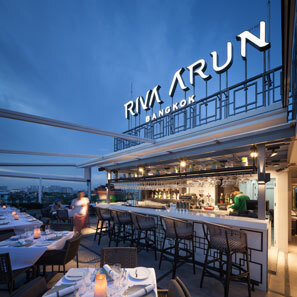 Owner | Operator : Supatra River Mansion Co., Ltd. | Silver Needle Collection Co., Ltd. 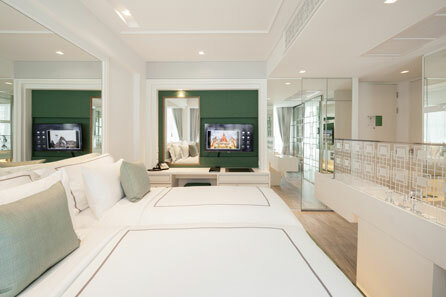 The Riva Arun Hotel is located on the Chao Phraya River in the historic Rattanakosin district of Bangkok established in the early 19th Century by King Rama 1 of the Chakri Dynasty, the longest reining dynasty of Thailand and recognized as the Rattanakosin Era during King Rama V reforms in 1888. 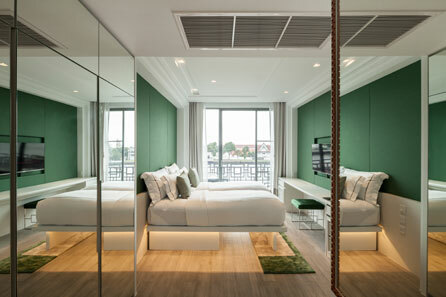 The second river hotel by the owners, this hotel is uniquely situated between several of the most revered historical monuments in Thailand’s rich cultural antiquity: Wat Arun (Temple of Dawn), the Grand Palace and Wat Pra Kaew (Temple of the Emerald Buddha). 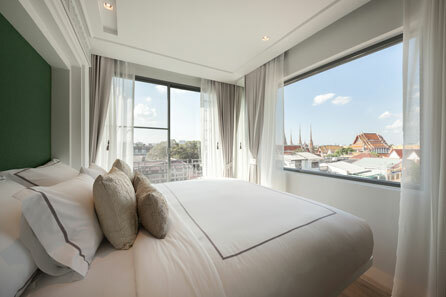 Given the location, the architectural and interior design inspiration was bountiful and self-evident: capture the spectacular west setting sun views to Wat Arun, the east morning sun and views to the Grand Palace and Wat Pra Kaew and capture the essence, depth and eclectic Rattanakosin architectural style which ranges from colorful Sino-Portuguese style shop houses, French and Dutch colonial styles and Chinese shop houses and historic river warehouses which processed sugar cane and rice. 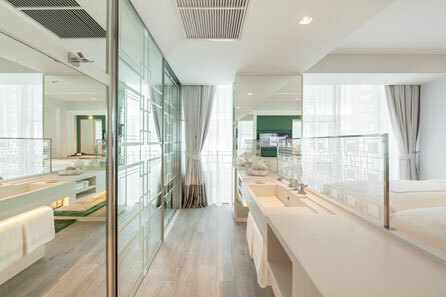 New or existing building sizes and heights are well restricted in Rattanakosin district. 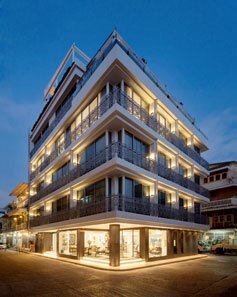 Therefore, the hotel is 4 floors in height and comprises 21 suites and 3 penthouse suites. 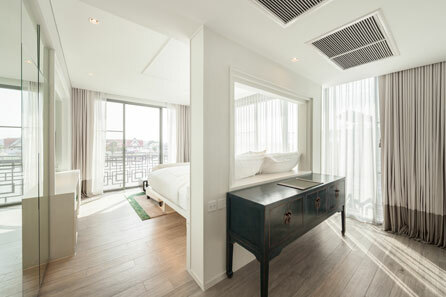 The hotel is successfully planned with guest rooms having either a view of Wat Arun or The Grand Palace. 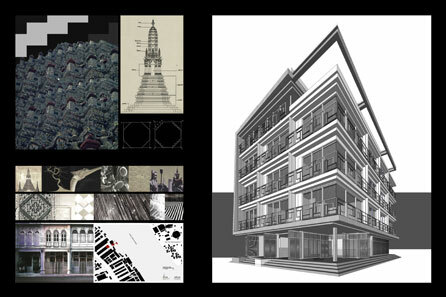 Drawing inspiration from both the stepping terraces of Wat Arun and the colonial era styles, windows and balconies are faceted, stepped creating shadow and depth in the morning and setting sun. 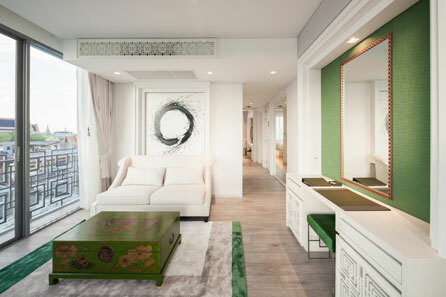 The unifying color scheme is black and white with Rattanakosin inspired accent colors of green and gold. 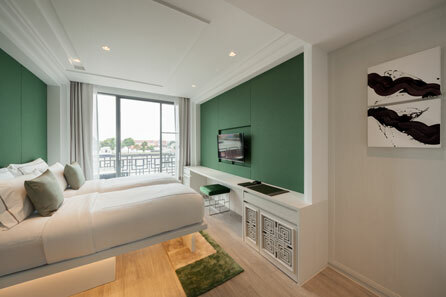 The exterior façade color is high contrast white and accented with dark grey edges to clearly distinguish the hotel when seen from the river boat traffic and from the surrounding shop houses and warehouses. 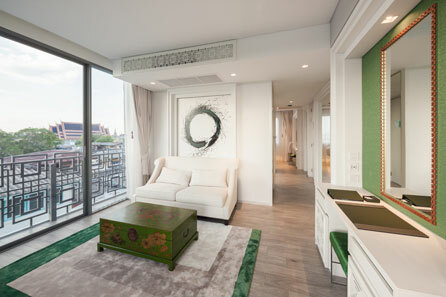 A unique and original thematic pattern and decorative motif inspired by the Rattanakosin era style was developed for the entire project. 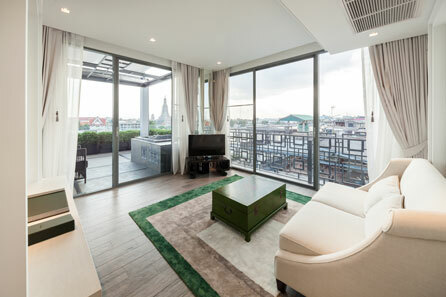 Exterior balcony rails, interior base relief decorative paneling, floor patterns, partition glass and fabrics all utilize variations of the thematic motif. 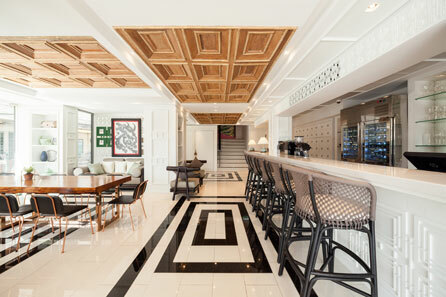 The Ground floor lobby is combined with the lobby bar, restaurant and open kitchen like an old colonial era Inn creating a comfortable, relaxed guest check in and dining experience. 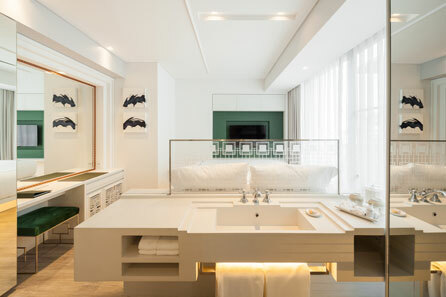 All rooms have ensuite baths and balconies. 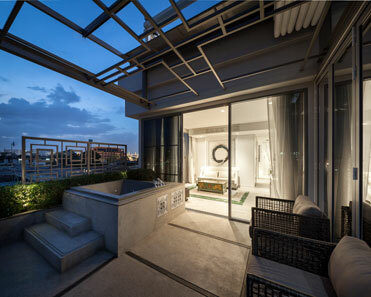 Penthouse luxury suites offer spacious garden roofs and outdoor pools. 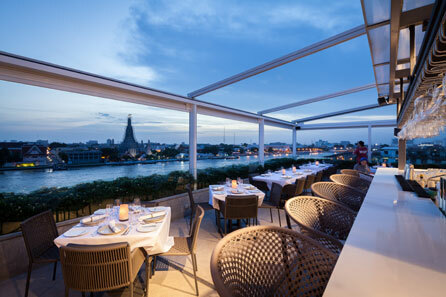 A top floor roof deck restaurant and bar offer stunning views to Wat Arun and the Grand Palace. 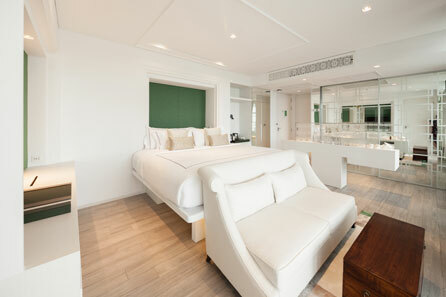 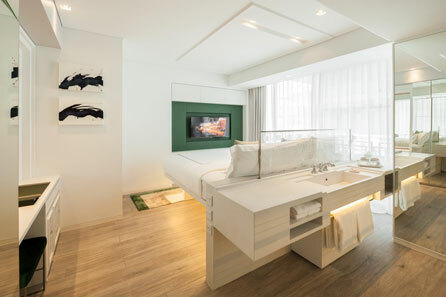 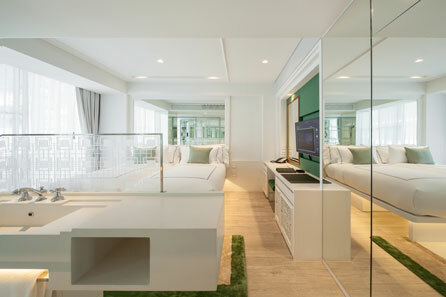 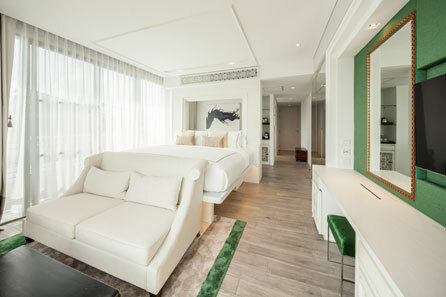 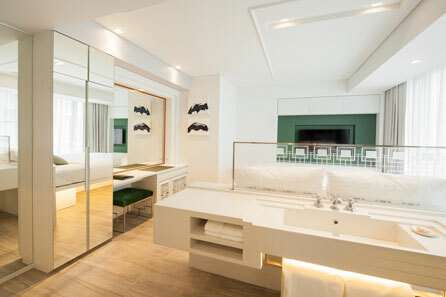 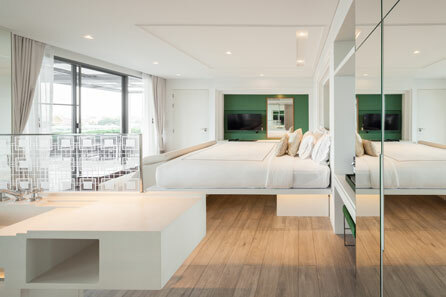 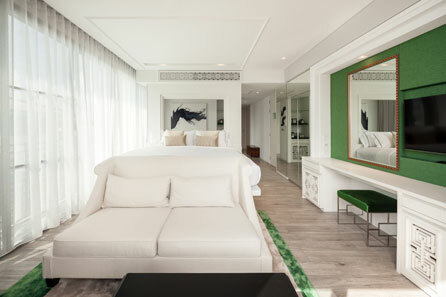 The hotel interior color theme continues the Rattanakosin and Temple of the Emerald Buddha era inspired simple white with accent emerald green motifs. 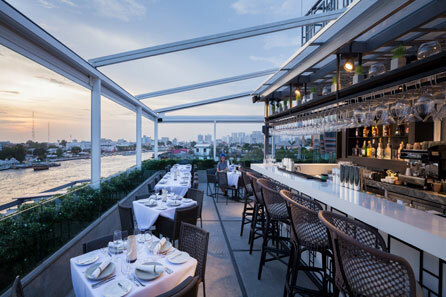 Gold accents reflect the golden temples shimmering in the setting sun. 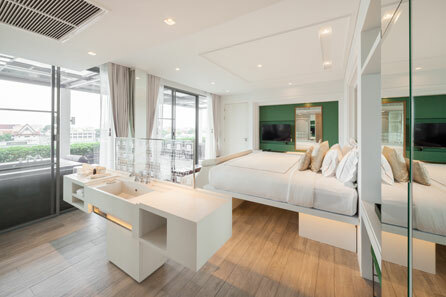 Wat Arun is adorned with colorful broken Chinese porcelain pieces believed to be the discarded ballast from Chinese merchant ships. 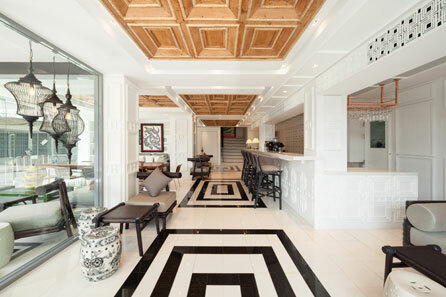 These colorful tiles inspired decorative artworks and styling. 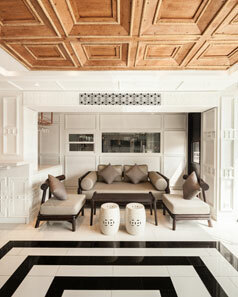 Teak paneled temple doors from Burma accent the lobby ceiling and combine seamlessly with the neutral grey and beige fabrics within the black and white color theme.